NBCUniversal’s Spanish-language network Telemundo is getting into the esports business. The company says it is launching what will be the first U.S.-based Spanish language esports channel. The channel will stream more than 2,000 hours of programming annually, launching first on YouTube and Twitch. The channel will be hosted by streamers Sofia Ornelas of Mexico and Juan “El Patan” Sotullo from Argentina. In addition, the company has signed a deal with video game publisher EA Sports to stream video and competition from that company’s FIFA19 Global Series events. Live coverage of the first tournament through that partnership will air next month. The network already has TV rights to FIFA, so wsports rights are. Logical extension of that. 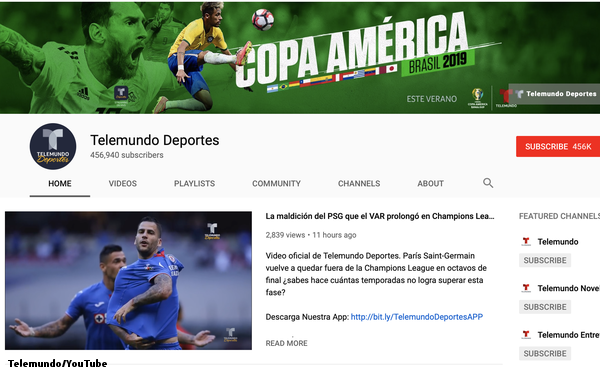 Telemundo Deportes has streamed esports events before, most notably a tournament featuring the game Rocket League. But the new dedicated channel marks a significant new investment in the space. With its young, male-skewing audience, esports have become a hot commodity for programmers and marketers. This week, Gillette announced a global deal with Twitch to sponsor 11 streamers from 11 countries, as well as TwitchCon Europe. Telemundo is betting that Spanish-language advertisers in the U.S. will find its proposition appealing.